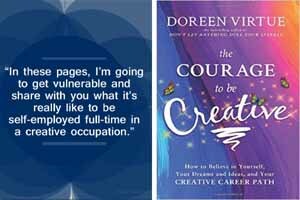 The Courage to Be Creative breaks down what it means to pursue a creative career and being self-employed full-time; moreover, Doreen Virtue experience going through this process herself and her students enrich it. Doreen Virtue deconstructs pretty well the journey from the creative concept to marketing the final product. For instance, the role of feelings in the creative process, addictions, visualization, affirmations, meditation, self-publishing or traditional, attorneys, managers and contracts, marketing, etc. Also, dealing with rejections. The Courage to Be Creative is a mix of spiritual and mundane approach, from giving inspiration to a time schedule, as long as we keep in mind that’s important to focus on creativity before money even though both are part of the equation. Finally, this is a Doreen Virtue book so you’ll find content about angels, prayers, and unicorns.